In this Photoshop photo effects tutorial, we'll learn how to create a simple snowflakes photo border, which can be a fun finishing touch for photos of family and friends during the holidays or of any snowy winter scene. I'll be using Photoshop CS5 here, but any recent version of Photoshop will work. The final "snowflakes photo border" effect. Photoshop ships with a ready-made snowflake brush that we could use for our effect, but its default size is a little too small for our purposes here, and increasing a brush beyond its default size makes it look soft and dull. Since we want everything to look nice and sharp, we'll quickly create our own, larger snowflake brush using one of Photoshop's built-in custom shapes (if you've already completed our Holiday Photo Border tutorial, you may already have a custom snowflake brush ready to use, in which case you can skip to Step 8). Make sure your measurement type is set to pixels, not inches or anything else. Click on the small triangle in the top right corner of the Shape Picker. Select the Nature shape set from the menu. Choose Append to add the Nature shapes in with the original shapes. Choose one of the three snowflake shapes by clicking on its thumbnail. Each icon in the row of three selects a different type of shape. The "Fill Pixels" icon is the one on the right. The black area will become the brush. The white area will be transparent. Name the new brush "Snowflake". 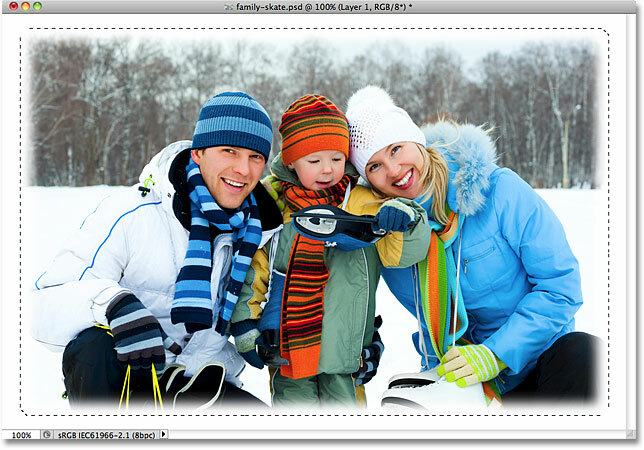 Add a new blank layer above the image on the Background layer. Set the Use option to White, then click OK. Hold down Alt (Win) / Option (Mac), then drag the top and left handles inward. Delete the area inside the selection but leave the outline in place, since we still need it. Go to Select > Modify > Expand. Expand the selection by 20 pixels or so. All four edges of the selection outline expand outward by 20 pixels. Increase the Radius value to 8 pixels, then click OK.
Click on the snowflake brush's thumbnail to select it, then press Enter (Win) / Return (Mac). Click on the words "Shape Dynamics" in the left column of the Brushes panel. Set the Size Jitter and Angle Jitter to 100%. Click on Scattering, then set Scatter to 250%. Click the Make Work Path From Selection icon. Temporary paths are called "work paths" in Photoshop. The thin line is the path the snowflakes will follow around the image. Drag the Size slider towards the left to lower the brush size. Click the Stroke Path With Brush icon, second from left. Scattered snowflakes with random sizes and angles appear along the path. Depending on the size of the image you're working with, you may find that the current brush size is too large or too small. If that's the case, press Ctrl+Z (Win) / Command+Z (Mac) to undo the initial snowflakes, then simply use the left and right bracket keys on your keyboard to change the brush size. Pressing the left bracket key ( [ ) makes the brush smaller while the right bracket key ( ] ) makes it larger. Once you've resized your brush, click on the Stroke Path With Brush icon to try again. It may take a few attempts with different brush sizes to get it right. Click in the empty area in the Paths panel to turn the path off. Turn the path back on by clicking on its thumbnail. You can only stroke the path when it's visible. And there we have it! 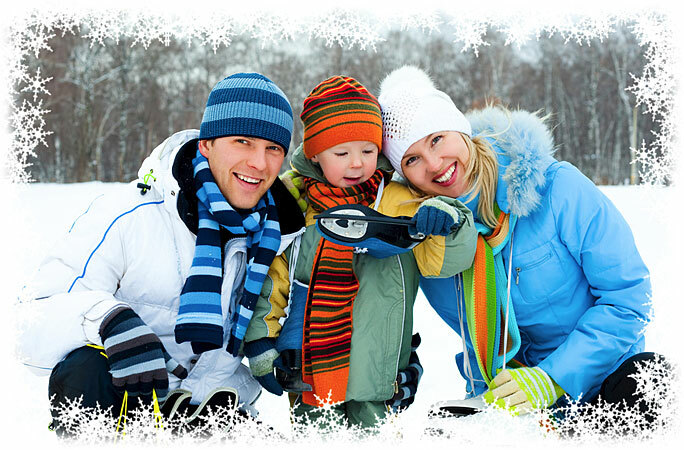 That's how to create a snowflakes photo border with Photoshop! Visit our Photo Effects section for more Photoshop effects tutorials!